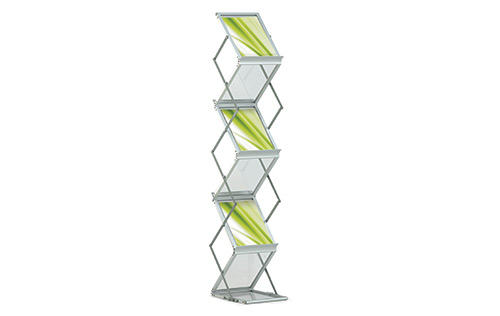 We offer a choice of two collapsible literature stands. The Media Compact Portrait (pictured) and Media 4 Deluxe will both collapse down for ease of transit, and are both supplied with their own carry bag / case. Both the Compact Portrait and 4 Deluxe will hold A4 portrait literature. Please phone 0800 999 KWIK and ask for further details to be emailed to you. FAST – We can generally supply in 2-3 days.